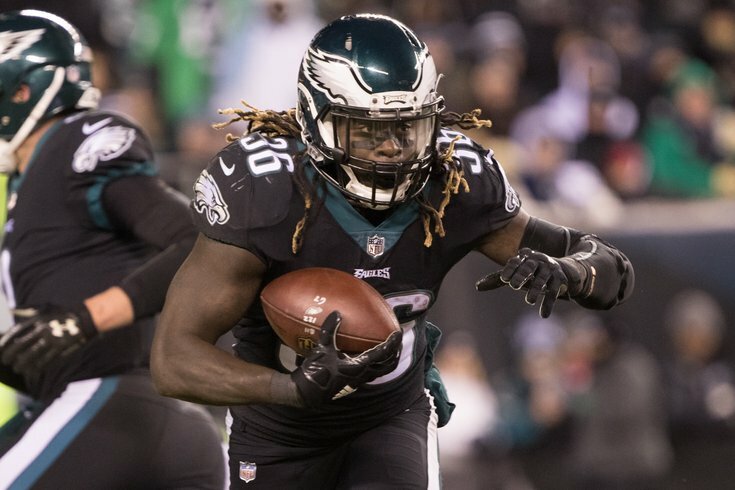 Jay Ajayi may have to carry the Eagles on Saturday. All season long, we've looked at five matchups to watch between the Philadelphia Eagles and their next opponent. In the playoffs, we'll look at five matchups on each side of the ball. This morning we started with when the Atlanta Falcons have the ball. Here we'll look at when the Eagles have it. We've beaten up on Nick Foles enough by now for his performances in the Eagles' last two games against the Oakland Raiders and Dallas Cowboys. I know he was dreadful. He knows it. Doug Pederson knows it. And you know it (or at least you should). So, how do you fix him? That's what Pederson has been trying to figure out for the last two to three weeks. "My message to Nick is, we have a great opportunity," Pederson said. "Let's go be Nick, go execute the offense." On that play, Foles had two different receivers open early. First, he has Zach Ertz on a seam route. That may not appear that open, but it is in the NFL. A confident quarterback would put that ball easily over the head of Sean Lee into the open space in the middle of the field for Ertz to go get it. Secondly, he has Alshon Jeffery open on the sideline in between the corner and the safety. That throw is there. For some reason, Foles did not pull the trigger on time on the throw to Ertz or Jeffery. I don't know if he felt phantom pressure, if he didn't want to get hit while throwing, or if he ran toward the sideline to make the throw easier, but there was no reason for him to leave the pocket to make that throw. As a result, the corner drifted back toward Jeffery, the hole with which Jeffery was open closed up, and the Cowboys defender happily accepted the gift interception because the ball came out two seconds too late, an eternity in high school, much less the NFL. Granted, that's not an easy throw to Jeffery. If it comes out on time, it's a 25-yard sideline throw from the opposite hash. Carson Wentz makes that throw in his sleep. Nick Foles? Not so much. Still, there's no room for timid play in the NFL at the quarterback position. You either let it rip, or you'll be sacked, or worse. He cannot be that player throughout the playoffs, or the Eagles will be toast. Nick Foles is not Carson Wentz, but he should be adopting Wentz's mentality to let it rip. Jones is an undersized, but athletic linebacker patrolling the middle of the Falcons' defense. He ability in coverage is outstanding. From the Eagles' perspective, it feels like Zach Ertz is Foles' favorite target, and the Falcons have a player capable of covering him. The Falcons play a ton of zone, so it's not as if Jones will be shadowing Ertz all day, but you can bet they'll cross paths plenty in the middle of the field. The Falcons have a number of undersized players on their defense, particularly at linebacker, so logic might dictate that you can run on them. However, on the season, they were ninth in run defense, at 104.1 rushing yards per game. They also allowed just 6 runs of 20-plus yards, which was tied for second-best in the NFL. As you can see, the Eagles have successfully run it against good run defenses. Of course, those run defenses had to worry about getting beaten through the air by Carson Wentz. There's little question the Falcons are going to pack the box and dare Foles to beat them. The Eagles are going to have to find a way to successfully run it anyway. Their best chance is to do so with Jay Ajayi, who is clearly their best and most explosive back, who also happens to be well rested. When Ajayi was still with the Miami Dolphins before they traded him to Philly, he carried 26 times against the Falcons for 130 yards in a 20-17 win. This is a matchup that heavily favors the Falcons, as Atlanta has two very good corners in Desmond Trufant and Robert Alford. As noted above, the Falcons are certain to pack the box against the Eagles' offense. That's what they did to Jared Goff in the first round of the playoffs, and they were successful with it. Against a lesser quarterback in worse weather, it's a no-brainer to take that same approach against Foles, or perhaps be even more aggressive. They are going to dare Foles to beat them down the field. That feels clear, to me anyway. Torrey Smith has been invisible most of the season, and Jeffery could struggle due to a lack of rapport with Nick Foles. As we've noted multiple times, on average, according to the NFL's 'Next Gen Stats,' Jeffery averages just 1.8 yards of separation between himself and the nearest defender at the time of catch or incompletion. That is the lowest amount of separation in the NFL among all receivers and tight ends with a minimum of 40 targets. For the Eagles, something has to give. If the Falcons are being extremely aggressive in stopping the run, the Eagles have to find a way to make a play down the field. Smith and Jeffery may have to prove that they can make a play to keep the Falcons' defense at least respect that possibility. 5) Nelson Agholor vs. ?? While a player like Jeffery typically isn't going to get much in the way of separation against opposing corners, that is a strength of Agholor's. In my view, Foles needs to see open receivers in order for him to feel confident throwing the football. As such, the Eagles may look to make Agholor a big part of their game plan in the passing game. Conversely, the Falcons may come to that same conclusion and decide to game plan to stop Agholor. It will be interesting to see how the Falcons decide to cover him.